I love playing with thread and fine yarn, but don't get to near as often as I would like. My primary interests are tatting, crochet and knitted lace. Here you will get to see the latest things I am working on. This beautiful butterfly is designed by Sherry Pence and is in her book "The Exquisite Collection of Tatted Butterflies". It is available from her Etsy shop, LadyShuttleMaker's shop, http://www.etsy.com/shop/LadyShuttleMaker?section_id=5051320. I tatted this one with Lizbeth size 20 thread, colors 655 and 656, Wedgewood Light and Wedgewood Dark. The pattern is easy to work, but I had a difficult time with this. Probably because I was WATCHING the Olympics instead of my tatting! The wings are tatted first and individually. When you tat the body, you join to both wings. The first attempt at tatting the body, I ended up with the top of the wings facing downward. My next attempt I joined the right wing at the wrong picots. Definitely lopsided. The 3rd time I actually paid more attention and it came out fine. Just love the blue colour of the Butterfly. What a great job. 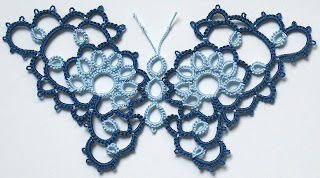 Could you please email me at Beverly5876@yahoo.com about doing a tatting designer review for BellaOnline Tatting? Dies ist ein wunderschöner Schmetterling. Gefällt mir sehr gut. I have been playing with thread since I was 9. My latest love is tatting, which I learned in 1995. I also enjoy fine thread crochet and knitted lace.